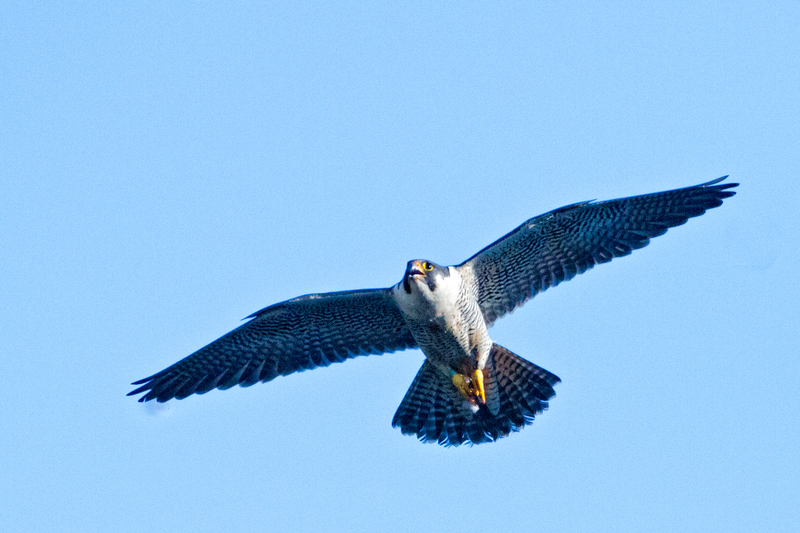 To assess the raptor migration on Bald Eagle Mountain, the project will conduct a single full-season fall hawkwatch from September through December 2019. Bald Eagle Mountain is the western-most ridge in the Ridge and Valley physiographic province, part of a ridge system that continues to the southwest with Brush Mountain, then Canoe Mountain, Lock Mountain, Dunning Mountain, Evitts Mountain, and Wills Mountain in Pennsylvania, continuing down through the Appalachians as far as northern Georgia. Historical part-time hawk counts on Bald Eagle Mountain indicate its promise as a raptor migration pathway, particularly for golden eagles and red-tailed hawks. Based upon those historical counts, Bald Eagle Mountain was named a Pennsylvania Important Bird Area, but we don’t really know the full extent of its value to raptor migration. High counts of these species in the fall at the Franklin Mountain (NY) hawk watch on northwest winds are often followed by high counts of these species several days later at Allegheny Front hawkwatch near Central City if the wind turns to be out of the east or southeast. We think that many of these birds are using Bald Eagle Mountain or the Allegheny Front to get there. Further, we suspect that the Allegheny Front hawkwatch tallies only a fraction of the migrant raptors that may use this migration pathway, because that site is highly dependent upon E/SE winds. To assess the raptor migration on Bald Eagle Mountain, the project will conduct a single full-season fall hawkwatch from September through December 2019. To assist with full-time coverage, Juniata Valley Audubon has formed a partnership with the State College Bird Club and Shaver’s Creek Environmental Center to support a paid full-time hawk counter. We anticipate that this project will document the considerable importance of Bald Eagle Mountain as a raptor migration pathway. You can help support this effort by signing up to participate in our Earth Week Birding Classic, which will be held from April 21 to 28, 2019. Registration is free. The goal is for teams in seven different categories to count as many species of birds as possible over a 24-hour period any time during the week beginning on April 21 at 12 noon and ending at 12 noon on April 28. This non-profit event is co-sponsored by the Environmental Studies program at Penn State Altoona and Juniata Valley Audubon Society. Pledges that team members garner this year will support the Bald Eagle Mountain Fall Hawkwatch project. Teams of three or more (two or more for Senior citizens) will count birds in Blair and surrounding counties, and prizes will be awarded during the closing ceremony at the Slep Center on the Penn State Altoona campus immediately following the event at 1 pm. Registration deadline is April 14. To register and for more information, please contact Catie Farr at catiegk5059@gmail.com. Check the events section of the website for a freshly updated listing of all our upcoming programs and field trips, including birding hikes, wildflower rambles, and more. The banquet this year will include a special celebration of the 50th anniversary of JVAS's founding in 1969! And don't miss the 4th annual Earth Week Birding Classic, our major fundraiser for conservation, held in cooperation with the Environmental Studies program at Penn State Altoona. There will be at least one other event which we don't have a firm date for yet. If you missed seeing the film Cathedral: The Fight to Save the Ancient Hemlocks of Cook Forest at our December meeting, we plan to offer another screening in March. Stay tuned. Author Dave BontaPublished on December 16, 2018 December 16, 2018 Leave a comment on At last, you can get a JVAS membership using a credit card! Juniata Valley Audubon Society will be 50 years old in 2019, so I guess it's understandable why we're not always an early adopter of the hot new trends. But more and more of our members, especially the younger ones, have been agitating for the ability to join and renew online with a credit card, so at long last we have complied. Go to the Join or Renew page and scroll down for the membership options. Your security is paramount, so we've had an SSL certificate installed on our server (thanks, Nittany Web Works!) and we're using Paypal as our payment gateway. But you don't need a Paypal account, just a major credit or debit card. We've tried to keep things as simple as possible, so instead of asking you to fill out a separate form, we will simply gather your email and postal address from Paypal, and will assume that you prefer to receive the paper edition of the Gnatcatcher unless you follow up with an email requesting otherwise. The one big advantage of joining or renewing online, aside from the obvious convenience of saving on postage and avoiding the hassle of writing out a check, is that you won't have to worry about forgetting to renew next year: it will automatically renew unless you cancel it. Better for you, better for us. We assume that, as a member of JVAS, you'd like to receive occasional emails about club activities and conservation issues, but there will be opt-out links in those emails so you can remove yourself from the list if it becomes too much. (We're planning a complete revamp of our email communications system in the New Year.) Please be assured, however, that we will not share your data with anyone else for any reason. There are, of course, limits to our embrace of modernity: we have no plans to accept Bitcoin payments at this time. Sorry, nerds. Published on December 16, 2018 December 16, 2018 Author Dave BontaCategories JVAS membersLeave a comment on At last, you can get a JVAS membership using a credit card! We have a full and varied list of exciting events on tap for the fall. The first field trip is on Sept. 8 and the first program meeting on Sept. 18. Author Dave BontaPublished on August 29, 2018 August 29, 2018 Leave a comment on Autumn events calendar is up! Thanks to Program Chair Laura Jackson and Field Trip Chair Susan Braun, we have a full and varied list of exciting events on tap for the fall. Browse the complete listing on the website. The first field trip is on September 8, when Nick Kerlin will present a talk and demonstration about bird banding at the Arboretum at Penn State, H.O. Smith Botanic Gardens. September's program at the Bellwood Antis Public Library on Tuesday the 18th will feature Nate Nagle talking about the Ruffed Grouse West Nile Virus study conducted by the Pennsylvania Game Commission. Nate will also discuss what the results could mean for other wildlife species, the environment, and humans. Note that the program meetings now begin 15 minutes earlier, at 6:45 PM, following an optional free supper at 6:00. There are also some special events on the calendar: a free workshop on bird feeding at Tyrone Milling on September 25, and on the first three Mondays in October, a series of interactive programs for gardeners emphasizing how native plants, water features, and cover are critical for pollinators and birds. 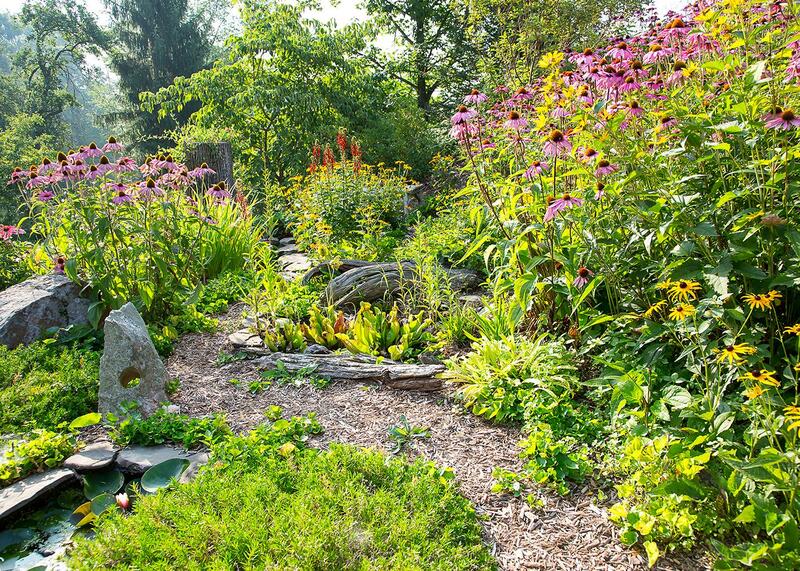 Learn how to turn your own yard into a healthy habitat. Attend just one, or all three. $10 per program. For more details and to register, see the Penn State Extension website. You need to register by Thursday, September 27, 2018 for the Oct. 1 program. Published on August 29, 2018 August 29, 2018 Author Dave BontaCategories JVAS activitiesLeave a comment on Autumn events calendar is up! Author Dave BontaPublished on January 15, 2018 Leave a comment on JVAS meeting for Jan. 16 is cancelled. See you in February! The weather forecast for Tuesday night is calling for snow and bitter cold, so the JVAS Board has decided to cancel the Jan. 16 Members’ Night meeting. While regrettable, this is precisely why we don't schedule a speaker in January — so that we can cancel if we have to. The forecast sounds especially dire for Bedford County late tomorrow afternoon. We hope to see everyone in February: at the Musser Gap hike on Saturday the 17th, and then at the program meeting in Bellwood on the 20th, when wildlife rehabilitator Robyn Graboski of Centre Wildlife Care will be talking about her work, accompanied by a live peregrine falcon, big brown bat, screech owl, and skunk! Published on January 15, 2018 Author Dave BontaCategories JVAS activitiesLeave a comment on JVAS meeting for Jan. 16 is cancelled. See you in February! Juniata Valley Audubon Society is proud to help sponsor local screenings of two fascinating and important nature documentaries this fall. Juniata Valley Audubon Society is proud to help sponsor local screenings of two fascinating and important nature documentaries this fall. Hometown Habitat: Stories of Bringing Nature Home, narrated by renowned entomologist, author and native plants expert Doug Tallamy, will be shown at the Canoe Creek State Park Education Center on Saturday, September 30 at 1:00 PM and at St. Luke's Episcopal Church in Altoona on Monday, October 16 at 7:00 PM. Chasing Coral, a Netflix documentary about the planet's disappearing coral reefs that the New York Times called "an emotional race against time," will be shown at the Altoona Area Public Library on Thursday, October 12 at 6:00 PM. These screenings are in addition to our regular monthly program meetings, and are co-sponsored with other local groups (because screening movies isn't cheap), but we've included them in our programs calendar for easy reference. Award winning director, Catherine Zimmerman, and film crew traveled across the country to visit Hometown Habitat heroes, who are reversing detrimental impacts on the land and in the water of major U.S. watersheds, one garden at a time. They wound their way through the watersheds of Florida, the prairies of the Mississippi River Basin, the streams and rivers of the Rocky Mountains, the Chesapeake Bay, the Great Lakes and Columbia River to share success stories and works-in-progress that celebrate conservation landscaping that re-awakens and redefines our relationship with Nature. Along with the everyday habitat heroes, Catherine and crew introduce us to ecologists, entomologists and other experts who share the science behind how today’s ‘native-plants-know- best’ enthusiasts, landscape architects and conservation groups are helping 20th century-minded city planners, businesses and developers appreciate the myriad 21st century benefits of low-maintenance, seasonally-dynamic and eco-healthy landscapes. The stories they traveled to tell touch on all aspects of the benefits of native plants and brings to light a sense of community that makes conservation landscaping possible. These are the stories. 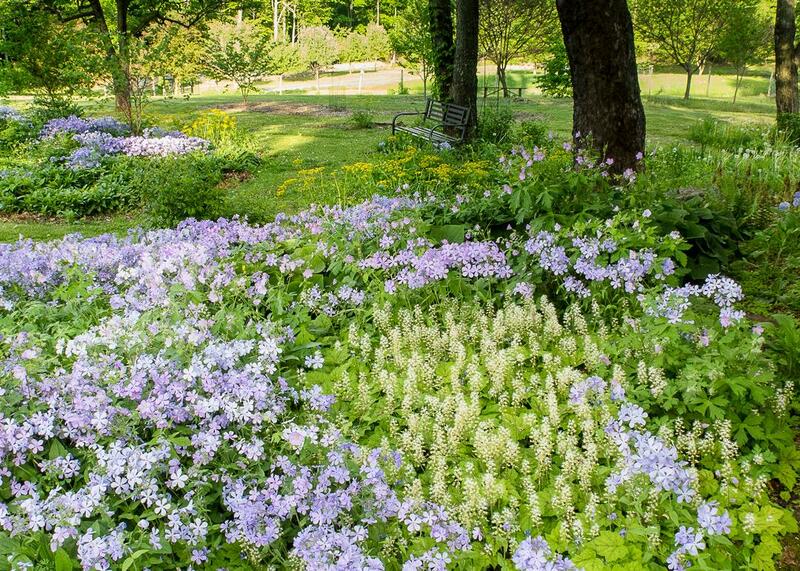 Laura says that this shows two flower beds full of spring blooms: blue woodland phlox, white foamflower, golden Alexander, wild geranium, wild ginger, Canada violets, and dwarf crested iris. There's also a patch of dandelions in the far right of the photo. The Jacksons let the dandelions go to seed in hopes of attracting white-crowned sparrows, which migrate through our area in the spring but nest farther north. The trees are white-flowering dogwood, wild black cherry, American redbud, and wild apple. All plants are native except the apple tree and the dandelions. 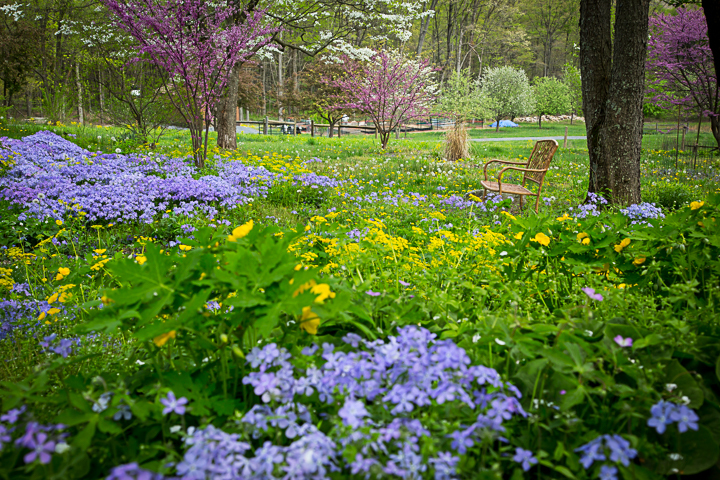 A summer-blooming native flower bed of mostly purple coneflower, black-eyed Susans, cardinal flower, and Heliopsis (ox-eye, or false sunflower). There is a small bog garden in the middle that contains native pitcher plants, sedges, purple violets, and ladies tresses orchids. In the foreground you can see creeping phlox that bloomed in the spring and a small pool with a water lily in it. All are natives, although the water lily is a cultivar of our native white waterlily. The trees in the background are white-flowering dogwood, white spruce, sweet gum, and black locust. Laura notes that the white spruce is not considered to be native to southern PA, but they had very few evergreens on their property, and it attracts bugs which are eaten by golden-crowned kinglets. The kinglets stay here all winter and only eat insects, even in the coldest of weather, so the white spruce helps to provide food for them. If all this whets your appetite to learn more, be sure not to miss one of the screenings on September 30th or October 16th, which should spark lively discussions afterwards. The first screening, at Canoe Creek, will be followed by an optional walk to look at non-native and native plants and to discuss their impact on native wildlife. Chasing Coral was directed by Jeff Orlowski and produced by Larissa Rhodes. The film took more than three years to shoot, and is the result of 500+ hours underwater, submissions of footage from volunteers from 30 countries, as well as support from more than 500 people from various locations around the world. Visit their website to learn more about how you can involved. An essential first step, of course, is to watch the film with us at the Altoona Libary on October 12th. There will be free refreshments and a short discussion after the film for those who can stick around. The latest issue of the Gnatcatcher, the newsletter of JVAS, is available for download and online viewing. The latest issue of the Gnatcatcher, the newsletter of Juniata Valley Audubon, is available for download and online viewing. (If you receive the paper edition, it should be arriving in mailboxes soon.) Articles in this issue include a message from the president, Laura Jackson, about saving the owls and other raptors on Amherst Island from industrial wind development; a profile of v-p Mark Bonta and his community conservation work; photos from recent JVAS field trips; reviews of two nature-related novels, Above the Waterfall by Ron Rash and Martin Marten by Brian Doyle, which sound as if they would make fine Christmas presents; information on how to take part in our annual Christmas Bird Count; and much more. Check it out! Are you a birder eager to explore one of Latin America’s hottest emerging destinations, but also interested in helping ensure that the birds and habitats you visit will be around for others to enjoy in the future? Do you also want to learn about other aspects of Honduran nature, and experience Honduran culture? And, would you like to travel comfortably, yet save big over other birding/natural history tours? 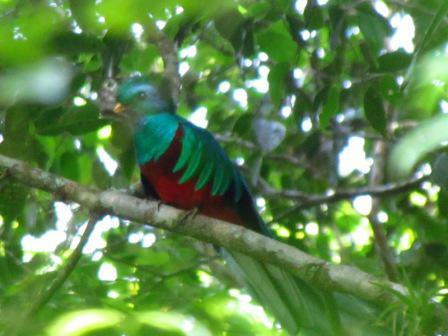 Author Dave BontaPublished on September 20, 2015 September 20, 2015 Leave a comment on Get away from winter — take part in a Birding for Conservation trip to Honduras! Are you a birder eager to explore one of Latin America’s hottest emerging destinations, but also interested in helping ensure that the birds and habitats you visit will be around for others to enjoy in the future? Do you also want to learn about other aspects of Honduran nature, and experience Honduran culture? And, would you like to travel comfortably, yet save big over other birding/natural history tours? The Honduran Conservation Coalition offers you an ethical, affordable alternative. Participants should see over 300 species of birds, a variety of habitats from coast to mid-altitude rain forests, and will visit some outstanding efforts by Hondurans to protect the environment and educate their citizens on birds and conservation. Trip leaders: JVAS vice president Dr. Mark Bonta, a Penn State Altoona geography professor and recognized authority on Honduran culture and nature, with 25 years’ experience in Honduras; and Gilberto Flores-Walter, bilingual Honduran birder and coffee farmer, as well as vice-president of the Honduran Ornithological Association. And don't miss our October program, Honduras: Wildlife, Parks, and People (Tuesday, Oct 20, 7:00 pm in the Bellwood-Antis Public Library). Mark Bonta, Ian McGregor, and John Dibert will describe their trips to some of Honduras’s most important protected areas. Published on September 20, 2015 September 20, 2015 Author Dave BontaCategories JVAS activitiesTags birding, ecotourism, HondurasLeave a comment on Get away from winter — take part in a Birding for Conservation trip to Honduras! Ron Johnson will describe his three expeditions to the second largest island in the world — home to more than 700 species of birds, including 33 birds of paradise. Johnson will explain the importance of the expeditions, tribal culture diversity and the urgency to preserve the world’s third largest rainforest. The Superb Bird of Paradise. Its breast feathers were used in headdresses. The Juniata Valley Audubon Society's September meeting will feature a program on Collecting and Conservation in Papua New Guinea. Join us at 7:00 PM on Tuesday, September 15, 2015 at the Bellwood-Antis Public Library for gorgeous photos and captivating stories of adventure. Ron Johnson will describe his three expeditions to the second largest island in the world — home to more than 700 species of birds, including 33 birds of paradise. Johnson will explain the importance of the expeditions, tribal culture diversity and the urgency to preserve the world’s third largest rainforest. 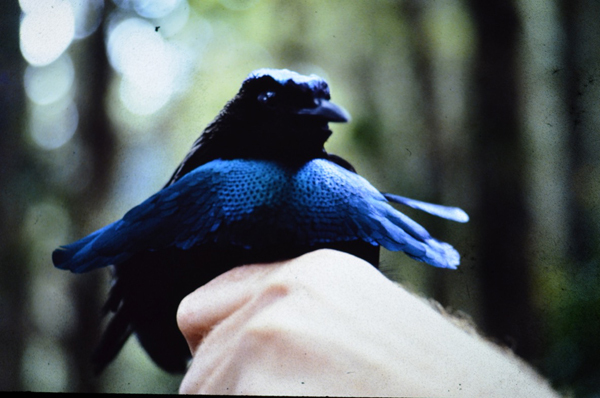 Ron Johnson was Curator of Birds at Jacksonville, Minnesota and Miami Zoos. He recently retired from the University of Wisconsin as an Aquaculture Outreach Specialist. He now lives in Pennsylvania and is a member of JVAS. As an added bonus, Papua New Guinea regional "treats" will be offered at the meeting. JVAS Programs, designed for a general audience, are free and open to the public. Directions: Take I-99 to the Bellwood/Route 865 Exit (Exit 41). Follow Rt. 865 through the Sheetz/Martin intersection. Proceed about four blocks and turn right at the “Business District” sign just before the railroad overpass. Turn left at the dead end and travel to the stop sign. Continue a short distance; the library will be on your right.